Full of valuable advice and a generous helping of humor, this book will help you feel better about your twenty-something life (and maybe even help you pull out a few more wins along the way). After his success with 101 Secrets for your Twenties, Paul Angone is going to capture the same hilarious, freakishly-accurate assessment of life as a modern-day twenty-something, but now he's digging deeper. It's time to move beyond desperately-trying-not-to-fail and take a swing at thriving. If you're drowning your anxieties in Netflix and ice cream, are afraid you're failing, going crazy, or both, or are just longing for a little guidance to get past "just getting by," this book is for you. 101 Questions You Need to Ask in Your Twenties by Paul Angone was published by Moody Publishers in April 2018 and is our 27717th best seller. 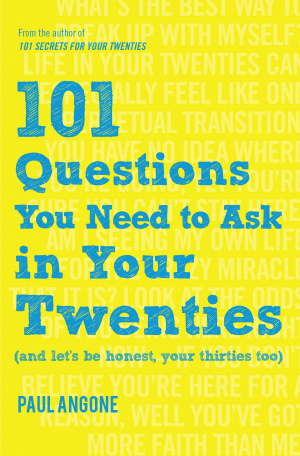 The ISBN for 101 Questions You Need to Ask in Your Twenties is 9780802416919. Be the first to review 101 Questions You Need to Ask in Your Twenties! Got a question? No problem! Just click here to ask us about 101 Questions You Need to Ask in Your Twenties.